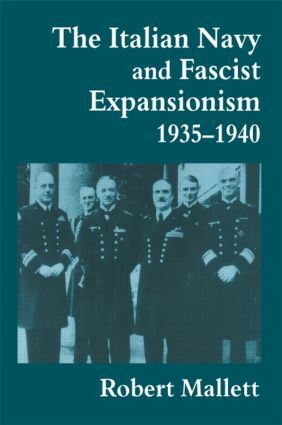 Robert Mallett argues that the Duce's aggressive war against the Mediterranean powers, Britain and France, was to secure access to the world's oceans. Mussolini actively pursued the Italo-German alliance to gain a Fascist empire stretching from the Mediterranean to the Indian Ocean. "This well-argued and researched book has caused a stir in Italy"
"Mallett has well researched naval planning in Italian naval archives. However, on the whole the work seems incomlete, its archival reach limited, its assertions at times inadequately documented, and contrary evidence slighted. Nonetheless, Mallett"s study enhances the debate that it does not resolve."